Gillingham were on the end of a hammering at the hands of Barnsley and slipped into the relegation zone as a result. Steve Lovell’s side now find themselves very much in a relegation battle and the only consolation on a disappointing afternoon was Elliott List’s strike ten minute from time, although by then it was too little too late. 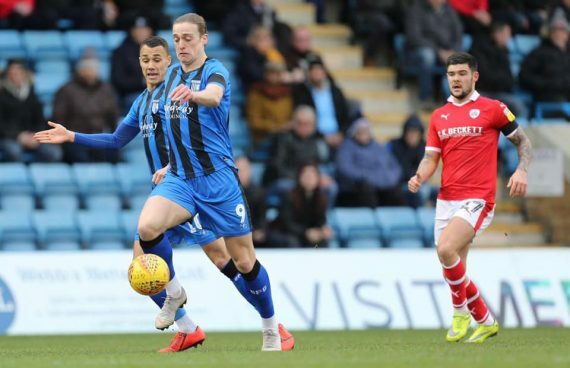 The Gills were behind after twenty seconds of the game thanks to Kieffer More, Cauley Woodrow netted himself a brace and Jacob Brown scored in injury time to put the cherry on top of the cake for the title chasing away side. Lovell handed January loan signing Billy King his debut at the Medway Priestfield and kept faith with Graham Burke up front after an impressive debut away at Coventry City the weekend before. However, no sooner had Trevor Kettle blown his whistle to kick the game off than the Gills were rather embarrassingly picking the ball out of the back of their net. Tomas Holy did well to make the save from McGeehan but he could do nothing about the rebound from Moore as he made it 0-1. It was clear to see why the Tykes are competing for the League One title, as they really should have doubled their lead three minutes later. Moore was in again on goal and rather than passing to Thiam who had space to just tap in the ball, he elected to go alone and forced another smart save from Holy. The game was pretty almost Barnsley in the early stages with McGeehan slicing an effort wide and Mowatt forced another save from Holy, who really was keeping the Gills in the game. The match was nearly twenty minutes old before the Gills managed their first chance of the game. Burke swung a free-kick, it was comfortably gathered in by Davies. He however, ended up in a collision with his own player the ball spilt out to Brendan Hanlan, he got his head to the ball but couldn’t keep it on target and head into an empty net. Connor Ogilvie soon after headed the ball clear, Tom Eaves picked up the ball and raced clear but he could only stab an effort at Davies in the Barnsley goal under pressure from a defender. Holy was once again in action at the other end to keep the score line 1-0 with a good save down low to his right hand side to stop Moore doubling the visitors lead. On the stroke of half time Barnsley did double their lead. Thiam sent an inviting cross into the area which was met at the back post by Woodrow. He had time and space to direct his letter over Holy and into the back of the net. The Gills had a mountain to climb in the second half and if they wanted to get back into the game they were going to need to do it early. They started the second half a lot brighter than they did the first half and created an early chance to get back into the game. Josh Rees thought a ball into the box was going to bounce to him, but as he prepared to pull the trigger a Barnsley defender nipped in and cleared their lines. On the hour mark Barnsley fans will have been left scratching their heads as to how they didn’t add a third goal. It was thanks to Max Ehmer and Holy that the Gills were still in the game as they made a series of well-timed tackles and saves to keep out the dangerous trio of Moore, Thiam and McGeehan. The next chance did fall the way of the Gills fought with Hanlan and Burke doing well to keep the ball in out wide before the ball dropped to Byrne in the area, however Barnsley got back to make a crucial block. Holy was once again called into action down the other end when he had to be alert to save well from Mowatt’s shot. He did well to tip it over for a corner, from the resulting corner however Woodrow converted a Thiam flick on to make it 0-3. With ten minutes to go in the game, the Gills reduced their deficit to two goals again. A Dean Parrett free-kick wasn’t cleared and made its way to List, who from the edge of the area made no mistake, blasting home his left footed shot to make it 1-3. There was a nasty looking collision just after the goal between Gabriel Zakuani and Moore, Moore was down for a long time, and needed the aid of a stretcher, he was taken to the hospital and subsequently discharged on Sunday morning. Zakuani left the pitch with the aid of crutches. The stoppage resulted in 12 minutes of added time. It was in the result injury time with Gills only having ten players on the pitch that they conceded a fourth goal with Brown smashing in off the cross bar to seal a good result for the Tykes. This entry was posted	on Saturday, February 9th, 2019 at 5:00 pm	and is filed under Featured, Football, Gillingham. You can follow any responses to this entry through the RSS 2.0 feed. Both comments and pings are currently closed.